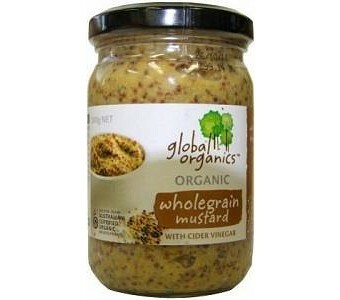 Global Organics Wholegrain Mustard is a tangy french style wholegrain mustard that contains a hint of cider vinegar. Perfect for spreading on sandwiches and works well as a salad dressing, this mildly flavoured mustard will burst on your taste buds with a tasty, seedy texture. Certified organic 100% natural ingredients No flavour enhancers No modified starches No animal products GMO free ingredients May contain traces of egg and milk Ingredients: Cider Vinegar (51.3%), whole mustard seeds, (29.5%), water, sea salt.